Bitcoin subject was on my interest radar for quite a while. Being involved in a number of projects related to modern e-commerce always saw disconnect between bitcoin as a [crypto] currency and the real world of products, stores and services where it’s hard to impossible to use bitcoin for day to day transactions. In other words if you have few bitcoins available for joy – it’s hard to find an easy way to spend it as you see fit. Sure, there were few geeky stores here and there that had weird “Bitcoin Accepted Here” signs, but nothing much beyond that. Alabama , Arizona, California, Delaware, District of Columbia, Georgia, Idaho, Iowa, Kansas, Maine, Mississippi, Nebraska, Nevada, New Jersey, North Carolina, North Dakota, Oklahoma, Oregon, Pennsylvania, Puerto Rico, South Dakota, Texas, Vermont, Washington, West Virginia. That suddenly makes life much easier for bitcoin owners – now you can buy stuff against your bitcoin balance. Which bitcoin balance? Shift Payments integrates with Dwolla and Coinbase, which means you can make dollar-based purchases that will auto-convert bitcoins at your Coinbase account to dollar with backup funds (in case you don’t have enough bitcoins) to be pulled out of Dwolla to fit the bill. You do not need to have Dwolla, just having Coinbase account is enough. I have account at Coinbase. When I got notification about bitcoin-based debit card availability – I ordered one right away to fully test it. 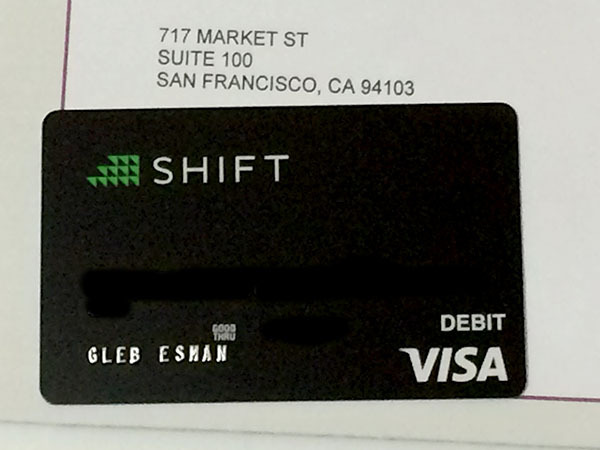 Shift Card is not the world’s first offering of bitcoin based debit card. There are few players here and there including some shady ones, although for me personally this was the easiest one to get because of my Coinbase account and California location. 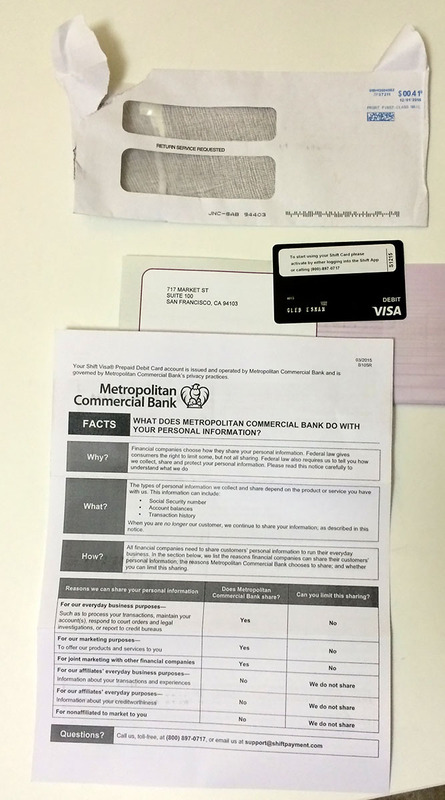 In about 2 weeks I got an envelope with the actual card, some basic information and activation procedures. First things I wanted to test is how many places actually accept this card, how many merchants would cause hassles or glitches regarding this card and what’s actual exchange rate that is being applied on purchases. As a bonus test, I wanted to see what’s the deal with withdrawing the cold hard USD cash out of ATM machine against my bitcoin balance using this card. And of course – what are the fees and exchange rates. 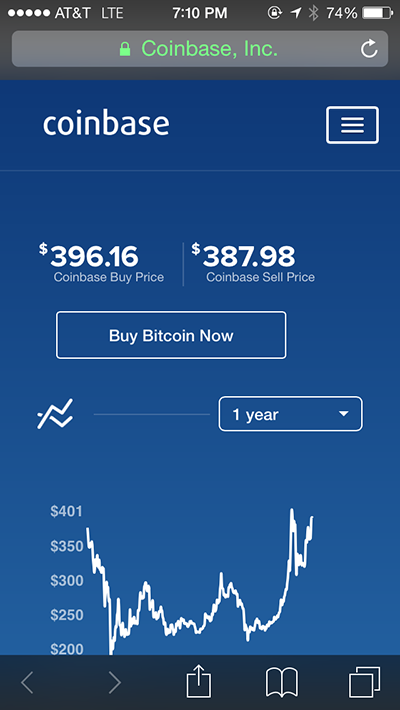 For exchange rate matching I used coinbase own bitcoin charts. As soon as I got card and activated it – very simple call to the 1-800 number provided – I took my daughter and we went to San Francisco Union Square for a stroll. 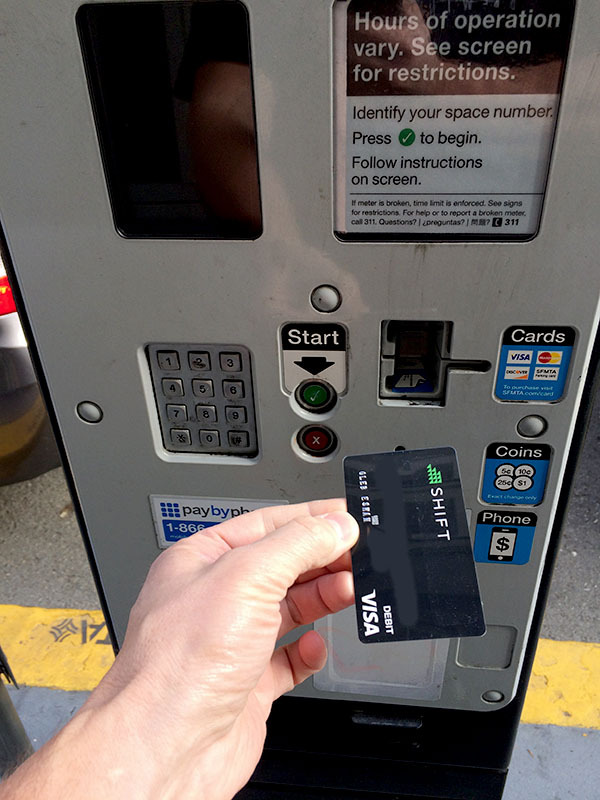 After initial struggle of finding street parking on a busy Saturday morning I decided to reward local street parking pay machine with my new Shift card payment. 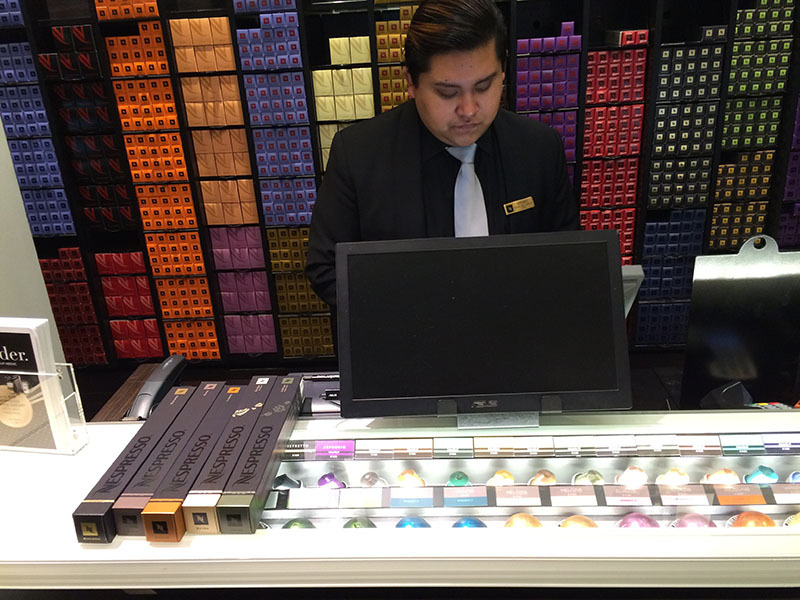 This went flawless – and payment went without a glitch. 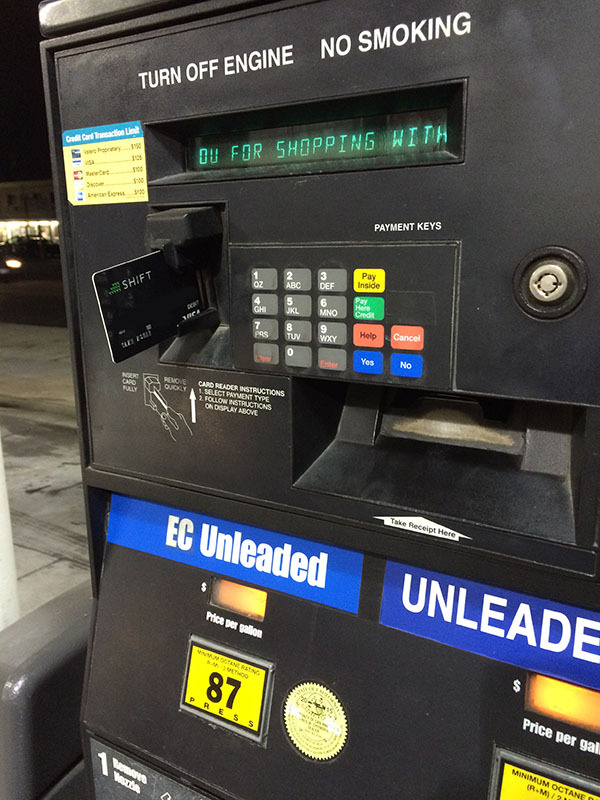 For a few seconds I event felt like a thief – I was almost sure that my card ought to be declined or reported as invalid or something like that. But more than that – within a few seconds I’ve received an email confirmation from that my payment went through just fine. Every time I used Shift Card the Coinbase bitcoin exchange rate snapshot was made. According to this data the exchange rate of transaction was $377.9378 – which is quite fairly in the middle of bid/ask spread. So far so good! Payment notification was delivered to me immediately by email. The total transaction was $35.50. Coinbase record shown dollar amount charge to be $35.49 which took 0.093933 bitcoins out of my account. The exchange rate of that transaction was 377.82. Which is again – almost exactly in the middle of that moment’s bid/ask spread (377.86). Which is fair enough. 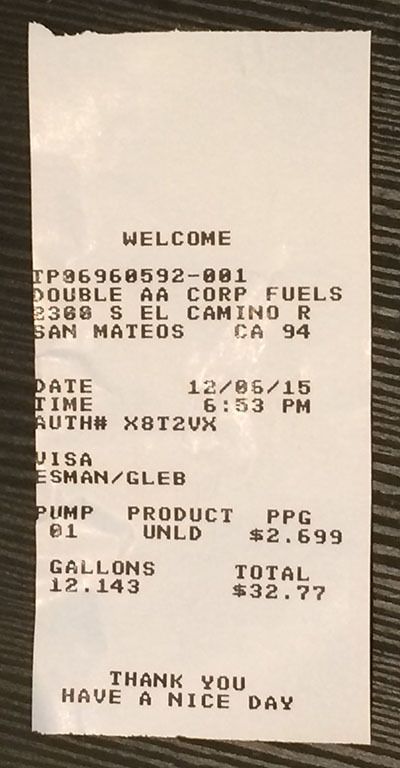 After typing necessary ZIP code – the pump was enabled and I was able to fill-in the gas tank without issues. There is one thing to mention: some merchants like self service gas pumps, rental car companies, hotels and some others authorize your credit card for an initial amount larger than the purchase amount. Then once everything is settled – the difference is released back to your card. This present some extra actions that are happening on the background. Even though I purchased gas for the amount of $32.77, my Shift card was charged $75.99 at an exchange rate of 391.79. The average exchange rate at the moment was: (396.16 + 387.98)/2 = 392.07. Which is again – in the middle of bid/ask spread considering it is being quite wide. A day later I was refunded $43.22 (to bring total spent back to actual $32.77). The refund was done at exchange rate of 392.99 – which was different from the time of original transaction rate. This is likely the rate that happened to be at the time of refund. Which could be hit or miss, depending on where bitcoin is going – but on the average we may consider this as a fair deal again. No extra fees was charged on any of these transactions, email notification was instant and exchange rate was applied at the time of transaction to be in between of bid/ask spread. Next purchase test I tried in Costco – but my transaction failed because I haven’t figured the PIN code. This was totally my fault. 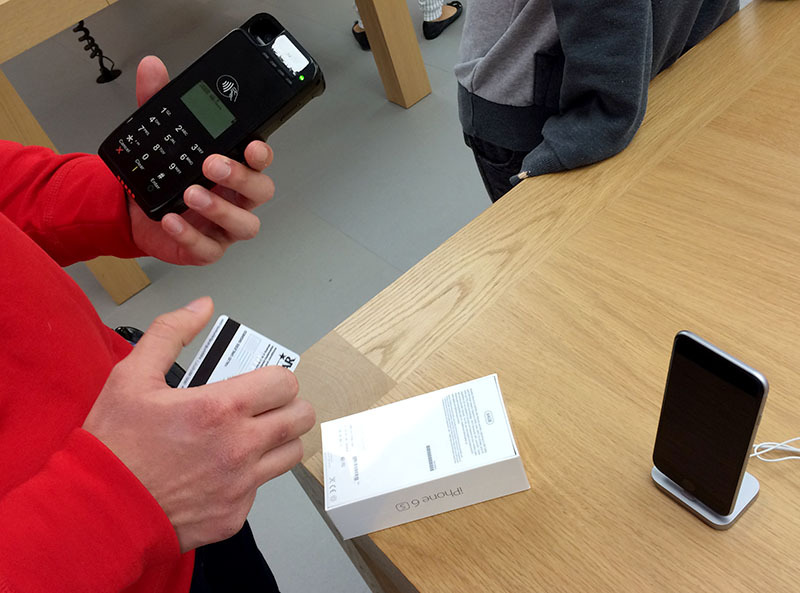 I planned to upgrade my phone to Apple iPhone 6s and decided to use my Shift card for that. To purchase iPhone 6s with 64GB memory outright I needed to have close to $800 available on my Coinbase balance, so I transferred 2 BTC to my Coinbase account. Then I headed to Apple store in Hillsdale shopping center in San Mateo. During the actual transaction I had to enter my debit card PIN code and this time transaction went through just flawlessly. The average exchange rate at that moment was (397.65+389.76)/2 = 393.7. Which is very close again. After iPhone purchase I headed down to amazon.com to purchase protective case and some other stuff, testing bitcoin Shift card there at online e-tailer. No problem there again – card went through to place an order and amazon actually placed a charge on it a day or so later when stuff was about ready to be shipped. The last test I did is for direct ATM cash withdrawals. 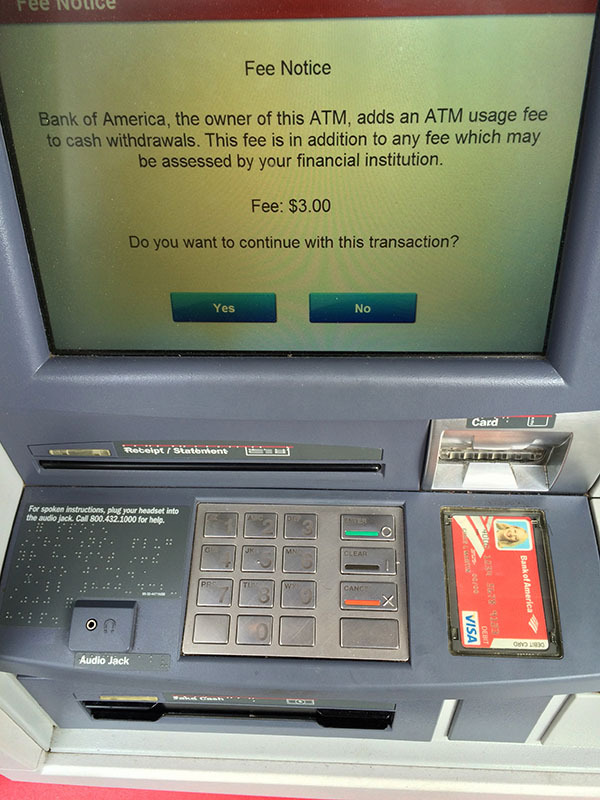 For that I headed to Bank of America ATM in San Mateo on 3rd Street. 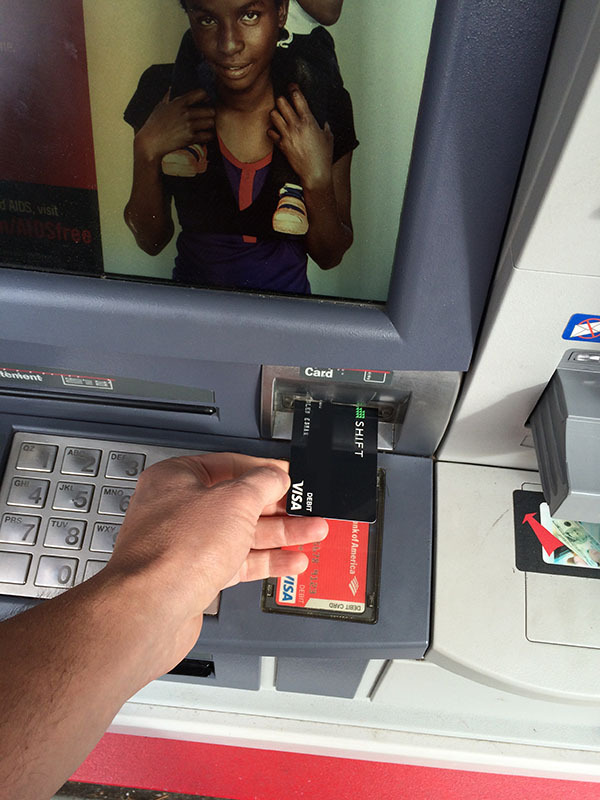 This of course involved paying rather hefty fee to ATM operator – $3 in this case. I accepted that for sake of $100 withdrawal test. This worked just fine as well! The average bitcoin exchange rate at the moment of cash withdrawal was $411.2. 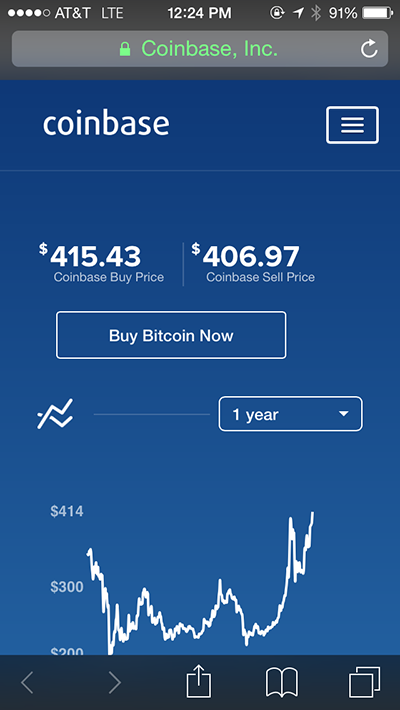 The exchange rate I was charged by Coinbase for this transaction was $411.31 – which was again in the middle of bid/ask. 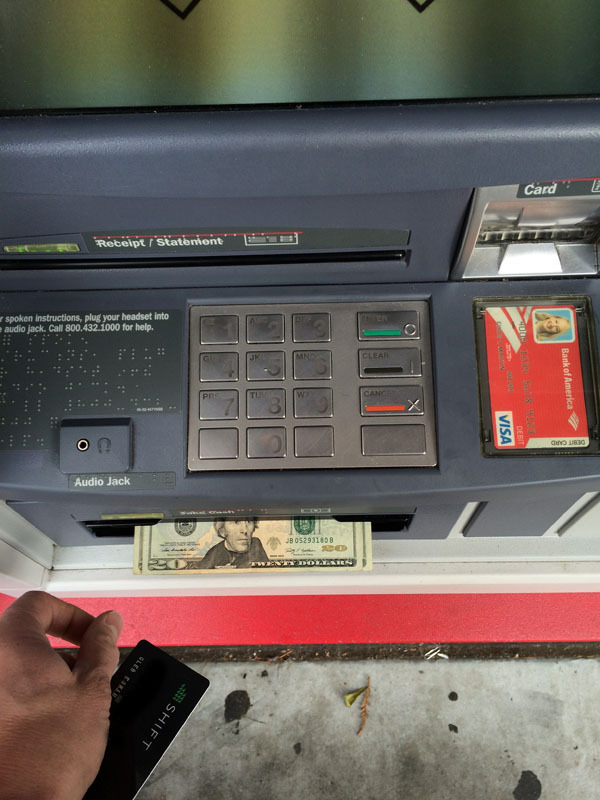 Cash withdrawals carrying higher fees: ATM fee ($3 for my case but may vary from ATM to ATM) + Coinbase fee or $2.49. Being an enabler of bitcoin-based payments in everyday life for millions of consumers and merchants nationwide. This is true win for Shiftpayments and Coinbase. 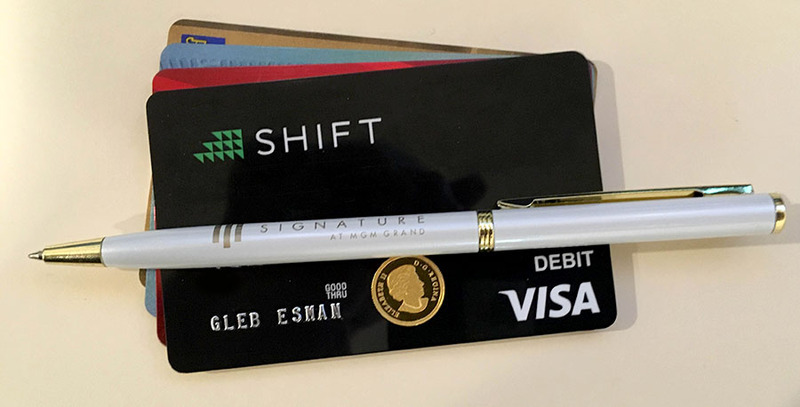 Shift card offers transparent and hassle free bitcoin-backed payments in US dollars at any merchant who accepts Visa or debit cards. Easy to get: I just moved to USA from Canada (in August 2015) and even with traditional “lack of credit history” there were no problems for me to open Coinbase account and then to apply and get Shift card. Simplicity of operation: It can be used *anywhere* where Visa credit card is accepted as well as where debit cards are accepted. That includes traditional retailers, Costco, Apple store, online stores like Amazon and similar as well as smaller merchants and automated paying machines. Fairness: there are no hidden tricks – exchange rate applied to your purchases is fair. No extra fees for purchases. Low fees: no fees for purchases. Fee for ATM cash withdrawals but nothing really surprising here. Easy way to convert bitcoins to small amount of cash if don’t mind ~5% fees and want to avoid shady dealers. Secure: any activity on the card and payment notifications are delivered instantly by email. All regular security and support procedures are in place. 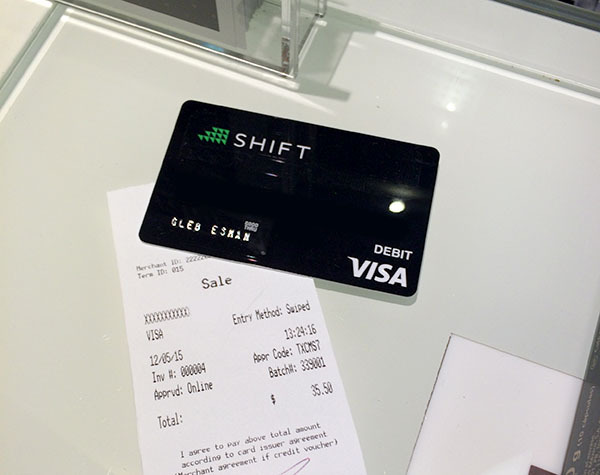 Shift card does carry restrictions to daily cash withdrawals and daily spending limits. While somewhat low – these are still perfectly acceptable to make normal and even high priced daily purchases as I’ve tested. No anonymouty – you have to submit personal information to open Coinbase account. To have your limits raised you need to be an account holder in good standing with verified bank account. This may pose issues for some, but should be no problem to an average American geek or entrepreneur or just smart citizen who wants to be part of the rising wave of cryptocurrency adoption in daily life!